Even in the dead cold of winter, you’re bound to see a few folks with their mitten-clad hands wrapped around frosty mugs of icy cold coffee drinks. No longer thought of as just a drink for warm weather, cold coffee has spent the last few years clawing its way to the top of many a coffee lover’s list of favorites. Considered to be up to 65% less acidic than its warm brew brethren, cold coffee often has a much smoother, less bitter taste. And that easier-to-drink profile has contributed to the overwhelming commercial success of the cold brew category, a fact not lost on manufacturers. Everything from pre-bottled beverages to instant mix kits line the shelves of big box retailers in America, but making cold brew coffee at home is fast becoming the preferred way for aficionados to enjoy their new favorite beverage. Iced coffee ain’t cold brew. If you saunter into your favorite house-of-beans on a warm July afternoon and order a tall iced coffee, what you’re quenching your thirst and caffeine habit with is actually hot brewed coffee that’s been poured over ice cubes. Let an iced coffee sit too long and the last watery, diluted sips will remind you of that. Cold brew coffee, however, undergoes a steeping process that isn’t unlike what a cup of tea would endure. However, true cold brew never even touches a drop of hot water. A small amount of ground coffee is added to a much larger amount of chilled water and allowed to rest for a period of time, usually in the 12-24 hour range, but sometimes as high as about 36 hours. The end result is a velvety-smooth coffee drink that’s markedly less acidic and completely delicious. Stir in a touch of cream and sugar, and you might just find yourself in danger of giving up hot coffee forever. Rest assured that your favorite coffee shop is well aware of this and has been devoting more of their menu board to frigid delicacies. In fact, they’ve been steeping a pot with your name on it since the night before last. And you could throw on clothes, grab your keys and your wallet (make sure not to forget it, since cold brew drinks can sometimes triple the cost of a regular cuppa), and go pay your favorite barista a visit. Or, you could sit tight and read up on the fantastic product line put out by the folks over at Primula and discover everything you need to start making your own cold coffee at home. Situated amidst the warm, sunny beaches of Boca Raton, Florida, a climate that’s quite conducive to cold brew coffee is family-owned Primula. A division of Epoca International, Inc, the company has been in business since 1991. A quick visit to their website will unearth a bevy of products, including coffee and tea brewers, drinkware, and accessories such as filters and milk frothers. Not content to just make great products, they also enjoy sharing their love of the brew game with others. They achieve this by maintaining a trove of recipes for your own tasting pleasure, as well as a regularly updated blog. But it’s their line of cold coffee brewers that has been garnering attention from the coffee community, for reasons that include simplicity of use and an attractive price tag. The company offers an assortment of brewers designed for the home, as well as portable products that will allow you to steep and drink from the same container. Leading the pack in terms of home-based brewers are the Cold Brew Glass Carafe Brewing System and the Winslow 1.6 Quart Brewand Serve Cold Brew Coffee Maker. Both are fantastic units for creating up to 50 ounces of cold brew coffee right from the comfort of your own kitchen and are nearly identical in every way. The Winslow unit, however, comes with a handsome black protective holder that secures to the exterior of the carafe and will fit right in with any modern kitchen ensemble. 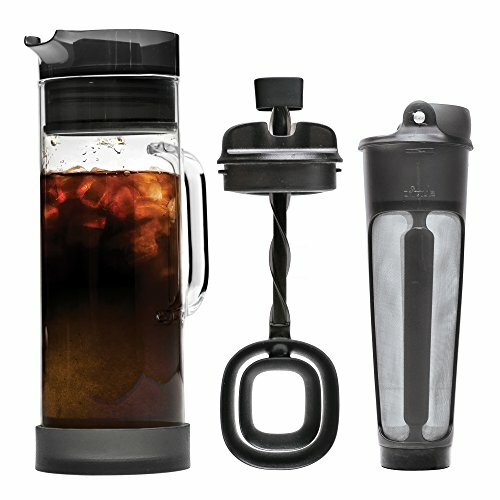 The Cold Brew Glass Carafe Brewing System may not have the protective covering but does come with a built-in handle. The carafe included with each model is manufactured from highly resilient borosilicate glass, chosen for being a versatile material capable of sustaining extreme temperatures, a perfect complement for even the chilliest of drinks. But the carafe alone is just the vessel in which to store your cool brew; the real magic happens with the brewing mechanism itself, which, in this case, is an inner-mesh basket of sorts named the MyBev Brew Core. Interchangeable among a few of the company’s mainline products, the core is constructed from a super fine stainless steel mesh that’s designed to keep your coffee grounds inside while their delicious flavor infuses with the surrounding water. Additionally, both units come with a fun, but oh-so-important accessory dubbed the MyBev Flavor Mixer. Serving the same purpose as a coffee stirrer, the mixer inserts into the carafe and makes it easy to stir coffee and any additional flavorings you may have added. Considering that a batch of cold brew can stay fresh while in the fridge for up to two weeks, the MyBev Flavor Mixer is an absolute necessity to make sure that every cup served is always as smooth and balanced as it should be. Regardless of which unit finds its way into your kitchen, you’ll be pleased to know that clean up is just as easy as using the brewers themselves. Both the top and the bottom of each product are removable, as is the bottom of the MvBev Brew Core. The non-porous glass carafe rinses completely clean so there’s no concern of flavor carryover or cross-contamination. And every component, even the brew core, is top rack dishwasher safe. then the paltry price point of $34.99 will surely seal the deal. That gives or take depending on any current sales or promotions the company may be running, but it still means that for less than a couple of stops at the neighborhood coffee shop, you can get your cold brew to fix on anytime you want it. Alright, so you’ve picked up your fancy new home brewer and are enjoying cold brew coffee whenever you’re around the house, but how about when you head to the office or take weekend trips? Primula doesn’t want anyone to suffer the pain of being stranded without their favorite cold coffee nearby, and their line of portable on-the-go brewers ensures that you never will have to again. Both their Cold Brew Bottle and Brew and Travel Cold Brew Bottles are excellent companion pieces to the home-based brewers. Capable of holding between 20-22 oz. of liquid, each bottle is manufactured from the same high-quality borosilicate glass found in their carafes. While the glass is fairly durable and capable of withstanding temperature extremes, there’s still a chance that sudden impact from an accidental drop could cause damage. To that end, each bottle comes with a protective loop perfect for attachment to a key ring or just as an extra finger-hold. The Cold Brew Bottle includes a removable neoprene sleeve for an added measure of protection that also provides a layer of insulation and helps reduce condensation. 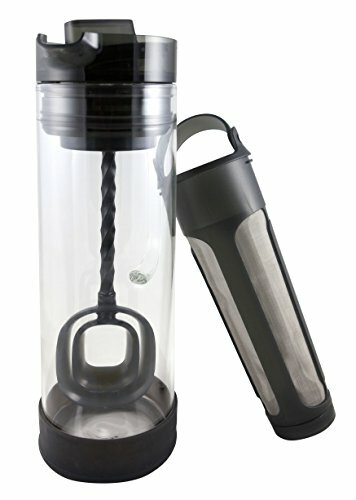 Unique to these on-the-go brewers is the mesh basket that’s located on the bottom of the bottle. Simply unscrew the cap, add in 4 tablespoons of your favorite coffee, replace the lid, and fill the bottle with water. In about 24 hours, you’ll have a bottle full of delicious cold brew that’s ready to hit the road with you or will be waiting at the office. And just like the home-based brewers, all components are completely removable and safe to clean on the top rack of your dishwasher. As far as the price point goes, the portable brewers are within a couple of bucks of each other. At the time of this writing, the Cold Brew Bottle sold for $23.99, no doubt as a result of the inclusion of the neoprene sleeve, while the Primula Brew and Travel retailed for $17.99. Very reasonable prices for such outstanding products. For our money, we’d recommend the Winslow 1.6 Quart Brew and Serve Cold Brew Coffee Maker for the home, and the Cold Brew Bottle for your mobile needs, if only for the extra protective holder that each comes with. And since both weigh in at such an affordable price, cold brew coffee can be anywhere you need it to be for around $60 combined. Primula products are for the cold brew connoisseur and the newbie alike and are built to ensure that you’re still going to enjoy them after a hundred cups as much as you did after the first one. So head over to the Primula site and order any brewer that you’d like. When the box shows up at your door, rip it open and be prepared to fall in love. And the next time that the cold brew urge hits, you can scratch the itch with a trip to the fridge.